A otherwise healthy 70 year-old woman presented to Genius General Hospital with multifocal pneumonia. In the ED she was treated with appropriate antibiotics and two liters of crystalloid. During her ED course she was found to have increasing tachypnea to 30-35 breaths/min, and was subsequently transferred to the ICU. In the ICU she became confused and her blood pressure fell to the to 80s/50s. A lactate value returned at 4.5 mM. This case occurred several years ago during my training. It was clear that the patient was slipping into septic shock and probably required additional fluid resuscitation and possibly vasopressors. Although she was quite dyspneic, I was hopeful that with prompt resuscitation she might be able to avoid intubation. I was afraid that further fluid resuscitation could compromise her pulmonary status, so my plan was to place a central line, transduce a CVP, and use the central line to provide vasopressor support and guide fluid resuscitation (1). The patient was prepared for central line placement and her entire body was draped. The procedure was difficult because she was confused and unable to stay still, but eventually the line was placed. When the drape was removed, it was clear that her respiratory status was continuing to deteriorate. I wasn’t sure about whether she required intubation so I obtained an ABG. The ABG confirmed that she was failing to ventilate adequately, and the decision was made to intubate. After the intubation her blood pressure dropped further, requiring initiation of vasopressors and placement of an arterial catheter. Luckily the woman did fine. However, this was a suboptimal resuscitation in several respects. From start to finish it probably took about two hours to place the central line, obtain an ABG, intubate the patient, place the arterial catheter, and initiate vasopressors. During most of that time, her blood pressure was inadequate and her breathing was unsupported. First, I would recognize that this patient is inevitably going to require intubation. She is in septic shock from pneumonia, she’s quite tachypneic, she’s delirious, and she’s deteriorating despite initial therapy. An arterial blood gas adds nothing to this assessment. Intubating her sooner rather than later will reduce her work of breathing and help resolve her shock. It’s predictable that intubation may drop her blood pressure. Therefore, while preparing to intubate I would initiate a peripheral norepinephrine infusion to bring her systolic blood pressure into the 120-140mm range (giving us a blood pressure “buffer” when her pressure drops during intubation). She could also benefit from additional fluid loading at this time. As soon as her blood pressure is adequate, I would pursue rapid-sequence intubation with rocuronium (1.4 mg/kg) and a sub-dissociative 0.5 mg/kg dose of ketamine (2). Immediately after intubation, while she is still paralyzed, a central line and arterial catheter could be inserted. Subsequently the norepinephrine could be changed over to the central line, and further volume resuscitation could be pursued with attempts to wean down on the norepinephrine infusion. Using a streamlined approach of intubating up-front and placing the central line and arterial catheter while paralyzed allows the three procedures to be achieved more safely and rapidly. Furthermore, her blood pressure would be supported throughout the entire resuscitation, and her work of breathing would be supported sooner. Immediate intubation and central access allows us to take control of her respiration and blood pressure, rather than hoping that she will stabilize on her own. For a patient who requires both intubation and various procedures, RSIP is the process of intubating first with Rocuronium and subsequently performing procedures while the patient remains paralyzed from the induction dose of rocuronium. Rocuronium is my paralytic of choice, regardless of RSIP (for a great discussion of rocuronium vs. succinylcholine, see Rubin Strayer’s video). Dosing Rocuronium on the high side (i.e. 1.4 mg/kg) is often safest as this provides the fastest and most reliable effect, even in patients with low cardiac output. One added benefit of rocuronium is that the patient will typically remain paralyzed for a while, allowing time to perform any necessary procedures. The crux of any procedure is positioning and sedation. If the patient is going to be paralyzed anyway, it will be easier and safer to perform any procedures while the patient is paralyzed. Adequate sedation and analgesia is crucial in RSIP because the paralysis will often out-last the initial sedative provided during RSI. A fentanyl bolus and infusion, as well as a sedative infusion should be started immediately after intubation. For a hemodynamically tenuous patient it may be safer to use a sub-dissociative ketamine dose during RSI to avoid complete sympatholysis (2). 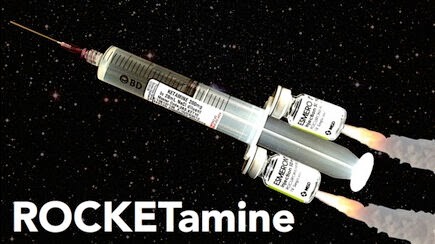 However, once the intubation is complete and the patient’s hemodynamics have stabilized, it may be merciful to provide an additional dose of ketamine (especially prior to any procedures). For a patient who requires intubation as well as other procedures, RSIP is a logistic strategy to accomplish several procedures rapidly. By performing the procedures under therapeutic paralysis, the speed and safety of all procedures is improved. Early intubation and sedation achieves control of the situation and reduces the level of chaos. (1) This is an old case. Significant research (i.e. Marik 2013) as well as the PROCESS trial has shown that CVP likely has no role in sepsis resuscitation. Although CVP remains in the current Surviving Sepsis Campaign recommendations, as of May 2014 this is not evidence based. If the ARISE and PROMISE trial substantiate the results of the PROCESS trial then hopefully we will all be able bury the practice of transducing CVP during sepsis resuscitation and move on. (2) For more discussion of this strategy for intubating the hemodynamically tenuous patient, see Scott Weingart’s podcast. (3) Image credits: Speedometer image from freeimages.com. Nearly 18 months later from when this blog post was written, would you still use 0.5mg/kg subdissociative ketamine dosing or bump up to 1mg/kg? Throwing the patient in a k-hole while paralyzed might wreak havoc on the sympathetics all the same, no ? Big fan of this technique though. I’m curious as to whether you dilute your peripheral norepinephrine to a lower concentration to infuse through a peripheral IV versus using the usual concentration you’d infuse through a central line. Is there a role for placing IO access under ketamine, at induction, and infusing norepinephrine through that? Do you have a written protocol for peripheral norepinephrine or is it a temporising measure before rapidly securing central venous access? Is Fentanyl no longer recommended for pre-intubation analgesia? Would this change when deciding between Etomidate and Ketamine? Ketamine is a powerful analgesic, so I don’t generally use fentanyl. I rarely use etomidate for patients with elevated ICP, which is a situation where I do use fentanyl.